Author and former Hollywood stuntwoman, Desiree Ayres offers a solution to the anxiety, depression, and physical challenges facing people who suffer with eating disorders. Drawing from her own testimony of being healed of anorexia, bulimia, and obesity, Ayres encourages readers to take responsibility for their emotional, spiritual, and physical health. She explains how negative self-image and lack of support are some of the key stumbling blocks to disorders that according to a recent survey affects nearly 70 million men and women worldwide. She also discusses the power of emotional health and its impact on the body. Ayres writes: "God wired us with emotions, but He did not intend for us to be ruled by them. Rather than turn to and fill up on God, they fill up on food. The answer is, of course, to run to God and fill up with his love and comfort." 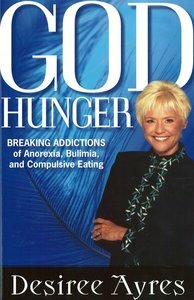 Written in an easy-to-read style, God Hunger provides readers with biblically based techniques for overcoming eating disorders, and lays out a strategic plan to help foster better health and wellness.